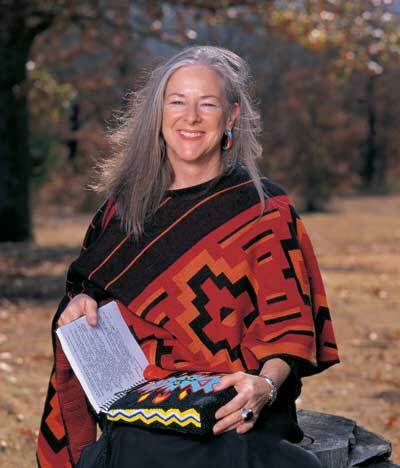 Linda Hogan, BEI Emeritus Fellow, is one of the three composers of “Lowak Shoppala’, including Jerod Impichchaachaaha’ Tate and Margaret Roach Wheeler. Here is the original article by Tony Choate. The Oklahoma City Philharmonic will perform a work by Chickasaw classical composer Jerod Impichchaachaaha’ Tate, Feb. 16 at the Oklahoma City Civic Center Music Hall. The composition, “Clans” from “Lowak Shoppala’ (Fire and Light),” is a theatrical expression of ancient Chickasaw clan leaders. A trio of Chickasaws are responsible for breathing life into “Lowak Shoppala’, including Tate; Linda Hogan, Pulitzer-Prize nominated writer and poet; and Margaret Roach Wheeler, world-renowned textile weaver and Native American fashion expert. February’s show marks the orchestra’s début of a composition by the Emmy Award-winning Chickasaw composer. In addition to a full symphonic orchestra, “Clans” features a Yuchi-Muscogee Creek narrator, seven American Indian actors and Tate leading a male vocal trio singing in the Chickasaw language. Words for the composition were written by Hogan, a 2007 Chickasaw Hall of Fame inductee; winner of numerous awards for books, poetry, and novels; and a global lecturer and writing teacher. Hogan received a master’s in degree English and creative writing from the University of Colorado at Boulder. She writes from a Native American perspective and is widely considered one of Native American literature’s most highly regarded writers. “Lowak Shoppala’ is one of the highlights of my career,” Wheeler said. “It allowed me to use my research from a fellowship with the National Museum of the American Indian on Mississippian Textiles. The Mississippians, or the Mound Builders (900 AD-1500 AD), were the ancestors of the Chickasaw people. In ancient Chickasaw culture, a family clan system was maintained through matrilineal descent. Each clan had an animal name. “Clans” focuses on seven of these family lines – Minko (Chief), Bird, Alligator, Squirrel, Skunk, Panther and Raccoon – and Tate’s composition incorporates numerous traditional Chickasaw melodies and rhythms. Tate’s work was included in the concert at the request of Alexander Mickelthwate, new conductor and musical director of the Oklahoma City Philharmonic. “I’m excited to include music from American Indian culture in our programming. Jerod Tate is a wonderful, creative man who is a classically trained pianist and composer and uses this ability to express his Chickasaw culture in a magical way,” Mickelthwate said. “Lowak Shoppala’” was commissioned by the American Composers Forum as part of its Continental Harmony Program, an initiative sponsored by the National Endowment for the Arts, to celebrate the full spectrum of American culture. It was first performed in 2009 at the Ataloa Theater in the Hallie Brown Ford Fine Arts Center on the East Central University campus. For years, Tate’s career has been dedicated to American Indian folk music in a classical repertoire. “Lowak Shoppala’: Clans” marks Tate’s 12th commission to specifically feature Chickasaw culture. Movements of Tate’s “Lowak Shoppala’ – Clans” may be enjoyed at the composer’s website, JerodTate.com/Lowak-Shoppala-Clans. To purchase tickets to the Feb. 16 concert, call 405-842-5387 or visit www.OKCPhil.org. online.